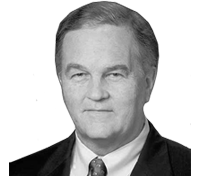 Steve Zelnak had a vision, one that would reshape the distribution dynamics of construction materials at Martin Marietta Materials Inc. Unfortunately for Zelnak, few others, if any, initially shared his vision. Zelnak, who joined the Martin Marietta Corp. in 1981 as vice president of planning and development, saw numerous opportunities for growth. Specifically, Zelnak saw viable markets along U.S. coastlines and 30 miles inland where populations were increasing and construction materials were lacking. In his vision, Zelnak sought to increase Martin Marietta’s reserves in every market from North Carolina to the Mexican border, and to serve the company’s markets by rail and sea. Still, Zelnak’s view of distribution was largely unheard of in the 1990s. 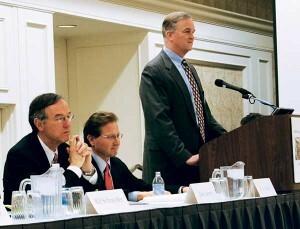 Zelnak had to sell others on his strategy, and he faced opposition in doing so. Zelnak, right, is pictured at an industry event with fellow Pit & Quarry Hall of Fame members Don James, Vulcan Materials, left, and Rick Feltes, Feltes Sand & Gravel, center. Photos courtesy of Steve Zelnak. Even some of Martin Marietta’s top investors doubted the strategy, according to Zelnak. “We hit a recessionary period in 2001 and 2002, and at the time we were spending heavily on the strategy,” he says. “[These investors] really began to question it. I responded to them and didn’t change the strategy but was certainly willing to talk it through. Martin Marietta executed the long-haul distribution strategy by zoning and permitting new quarries and, in Zelnak’s words, “putting a lot of them on the shelf.” In all, Zelnak was responsible for more than 70 acquisitions that broadened the company’s geographic footprint. Zelnak agrees the approach implementing Martin Marietta’s long-haul distribution strategy required patience. Martin Marietta continues to build on the model Zelnak put in place. “When you look at an industry in which 90-plus percent is sold by truck, to suddenly have a business that’s moving 20-plus percent of [aggregates] by rail is not something that would just occur,” Nye says. Achieving new efficiencies in rail distribution was part of Zelnak’s goal, as well. Zelnak’s vision for long-haul distribution was ahead of its time from a regulatory standpoint, as well. He anticipated the current regulatory environment developing, particularly regarding water use and land permits. Zelnak shaped Martin Marietta in other ways, too. He led the initial public offering (IPO) of Martin Marietta stock in 1994, and in 1996 he led the offering of the remaining stock held by Lockheed Martin as Martin Marietta became an independent New York Stock Exchange-listed company. According to The Baltimore Sun, Martin Marietta initially offered 7.65 million shares at $23 each. Yet, within the first hour shares were trading at nearly $26. Shares stretched as high as $168 on Zelnak’s watch, he says. But the stage to go public was set several years before 1994. When Zelnak started with the Martin Marietta Corp. in 1981, Martin Marietta was a large aerospace defense contracting company that had aggregates operations. Zelnak took over Martin Marietta’s newly constituted aggregates division based in Raleigh, N.C., in 1982, at a time when that division was struggling, he says. By the late-1980s, the aggregates division represented 7 percent of Martin Marietta’s revenue and 21 percent of the company’s profit, Zelnak says. By 1988, Zelnak started talks of making the aggregates division a separate company. Plans were made to separate the division in 1991, he says, but the economy tanked at that time and put a separation on hold. Yet, Zelnak pressed the talks, incorporated Martin Marietta Materials as part of the Martin Marietta Corp. in 1993 and listed the company on the New York Stock Exchange a year later. “Based on my projections of the long term, I expected the [IPO] to do exceptionally well,” says Zelnak, who grew Martin Marietta revenues from $450 million to more than $2.2 billion during his tenure as the company’s CEO. Zelnak’s Martin Marietta peers also credit him with setting the tone for the company’s culture today. 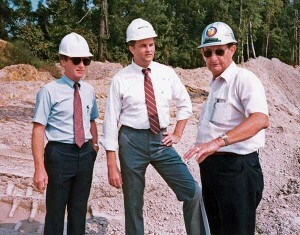 Zelnak, center, pictured in 1987 at Martin Marietta’s Belgrade Quarry in Maysville, N.C.
“[Regulation] was our best friend because those requirements were expensive,” Zelnak says. “It chased a lot of operators out of the business and really limited competition because of the amount of investment you had to make to compete. That’s what regulation does. Zelnak left his mark on Martin Marietta’s culture in other ways, including his work ethic. Nye also describes Zelnak as professional, disciplined and substantive. Lloyd takes notice of the opportunities Zelnak provided within Martin Marietta for women. Customers also benefited from Zelnak’s ethical approach. “One thing I wanted to do when I took over Martin Marietta was to eliminate antitrust violations,” Zelnak says. “I didn’t mince any words, making it very clear to people that we were going to abide by the letter and intent of the antitrust laws. If you chose not to do that willfully, then you were betting your job. “The reality is that in the 27 years I ran the company, we had zero antitrust problems,” he adds.